Crystal Reports solutions for web, report viewing, automated delivery and more. 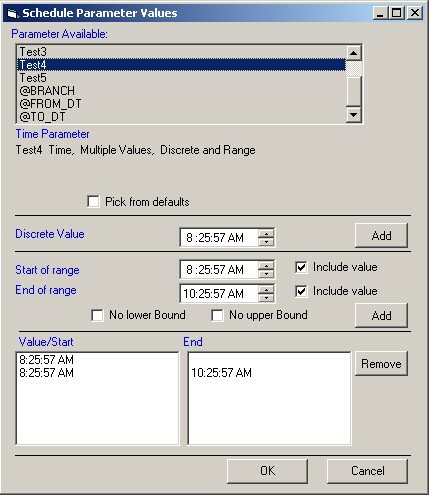 A friendly, affordable tool for automating production of your Crystal Reports. Download a 20-day trial version of Report Scheduler. 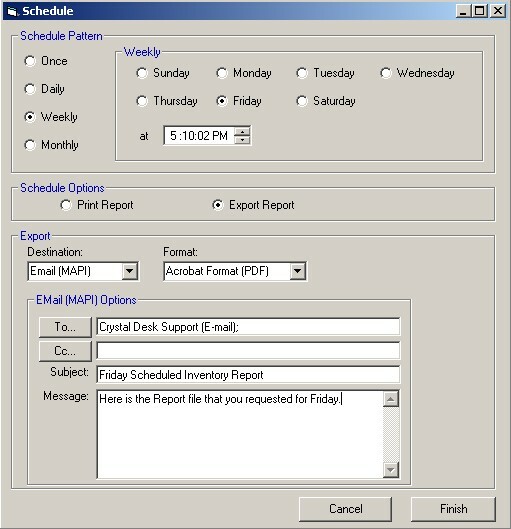 Report Scheduler enables you to schedule your Crystal Reports for printing, exporting, or delivery via email. Report Scheduler may also be used with ReCrystallize Pro to provide web reports that load quickly and reduce database access during peak hours. Using Report Scheduler's friendly interface, you can schedule reports to run Once, Daily, Weekly, or Monthly at a specific date and time. Scheduled Printing allows you to select a printer and the number of copies to print. Scheduled Exporting allows you to select the export format type and location where the file will be saved. Available export formats include Word, Excel, HTML and PDF. Report Scheduler will prompt the user for report parameters and database logins and save them with the schedule. "Report Scheduler has allowed me not to worry about running management reports that are due at the beginning of each month. I have scheduled parameterized reports for the next 2 years! The reports are already run and ready for the boss to review when he walks in the door. That, in itself, makes it worth the purchase." Copyright � 1998-2018, ReCrystallize.com LLC. ReCrystallize, the ReCrystallize logo, ReSolutions, and "Where solutions take form." are trademarks of ReCrystallize.com LLC. Crystal Reports is a trademark of SAP Business Objects. All other trademarks are the property of their respective owners.